Custom Products Manufactured in the U.S.A. In-house Union Scenic Artists dedicated to finding a solution for your visual communication project! 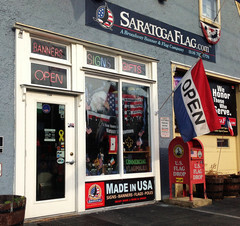 RETAIL STORE: The www.SaratogaFlag.com e-commerce Shopping Cart site carries our most popular items, where products made in the USA are our priority! • Authorized Dealer for USA Flag Manufacturers (Annin Flagmakers, Valley Forge Flag, Eder & more!) Order online anytime, 24/7. Tuesday - Friday: 10am - 6pm. All USA Flags are ALWAYS MADE IN USA! Custom Products Made in USA! Imported Items available as needed. Authorized Dealer: Annin Flagmakers, Valley Forge Flag, Eder Manufacturing, J.C. Schultz Enterprises, & More. Call us: (518) 792-1776. We love to hear from you! Thank you for supporting American-made products & our USA Small Business! 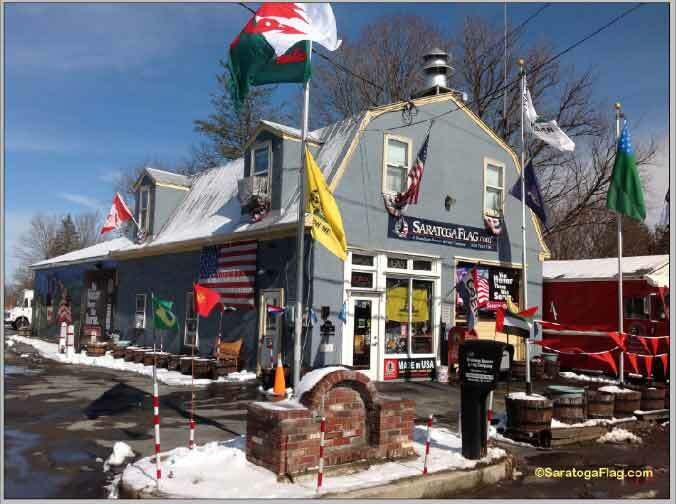 Visit the SaratogaFlag.com e-commerce website to place orders online. Order online anytime, 24/7.